I'd like to do a survey, a little informal study, of the works commissioned by the powerful. 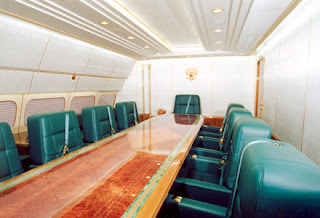 This photo portfolio of Putin's new plane evokes once again the frequently missing link between power and taste. Mau's challenge ("Now that we can design anything, what will we design?") does not, apparently, cross the minds of the powerful ("Now that I can do anything...").